One of the main reasons we love independent film is because we crave diversity and innovative storytelling, with real-life situations depicted in ways that often blur the lines between documentary and fictional narrative. But it isn’t every day that one of these starkly realistic indies comes along that the entire family can watch together—particularly one which takes on a hot-button issue like bullying. Enter filmmaker Barnet Bain’s new feature, Milton’s Secret. 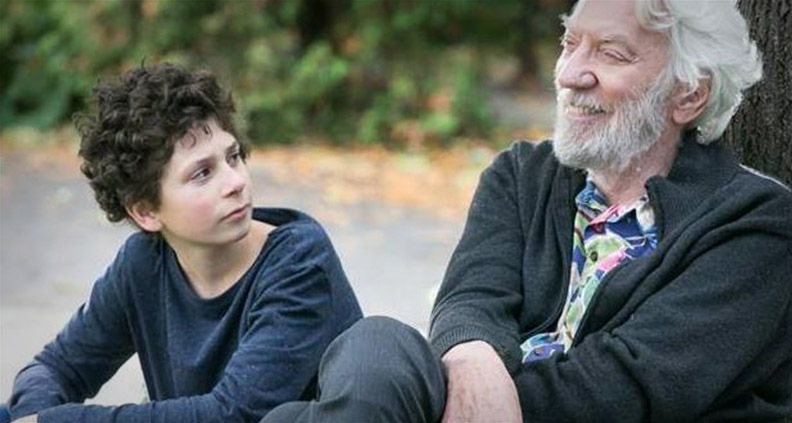 Bain’s independent family drama stars William Ainscough as the titular 11-year-old Milton, who appears alongside veteran actors Donald Sutherland, Michelle Rodriguez and Mia Kirshner. On the brink of puberty, Milton struggles with challenges many children across the world unfortunately face. One such challenge being the emotional distress caused by being the victim of bullying. A worldwide issue not fully understood until more recent years, bullying is one of Milton’s main thematic elements. The film continues a conversation that’s taken far too long for the world to start addressing as a serious topic in desperate need of increased awareness and serious solutions for prevention, particularly within the school system. Milton’s Secret takes on the bully but maintains a PG rating, depicting Milton’s tormentor on a mild note that underlines the trauma being inflicted without necessarily bringing audiences to too dark of a place. In fact, the film is adapted from the bestselling children’s book by authors Eckhart Tolle and Robert S. Friedman. Tolle—a teacher and author—is most celebrated for his acclaimed spiritual guide The Power of Now, which has been called one of the most influential books of our time. In 2008, Tolle collaborated with Friedman to create Milton’s Secret, challenging young minds with a complex set of teachings about self-awareness, being present and overcoming fear. The book was adapted for the screen by Bain, Donald Martin and Sara B. Cooper. How did you become involved with this project? Had you read the book, or had you read any other books by Eckhart Tolle? The film is based on a work of juvenile literature meant for very young children. I received the galleys from the publisher and immediately thought it would lend itself to an adult story about families, and the uncertainty and stressful times families live in. I met with Eckhart Tolle, who I’d of course heard of but did not know, and we discussed what I had in mind. He encouraged me to go forward. What was it like working with Donald Sutherland? How’d he become involved? Donald Sutherland has made 180 movies with everyone from Fellini to Altman to Roeg… you name it. So there’s this history that comes along with Donald. You feel it. Donald is a generous collaborator, knows exactly what’s happening always. What lens he’s on… everything. And that keeps you on your toes. Donald read the script and fell in love with the character. He wrote to me immediately and said he went to sleep, and that when he woke up the next morning his character Stuart Howard’s slippers were already parked under his bed. He was in. How did you approach the psychological effect of what was happening when directing William in the bullying scenes? The major challenges in Milton’s life are more similar than dissimilar to those in most children’s lives. Am I safe? Do I belong? Am I valuable for who I am, or am I valued for what I do? That’s a big one. William is unusually in touch with his feelings. By the time most kids reach his age they’re often split off from their feelings and more attuned to anxiety—which is worry about feelings, not feelings. So we tried, especially with the kids, to bring about a bodily awareness of feelings using breath, stillness, sharing. When feelings are experienced, felt and released, we can move on. That’s how we worked. Is bullying something you felt a strong desire to make a film about? The bullying theme is a big deal for me. There’s the obvious violence of bullying, both physical and emotional. That’s there. But even subtler is the violence we do to ourselves as a result of our bullying self-talk. You’re not good enough, smart enough, rich enough. You’re too tall, thin, black, white… You get the point. This thought-stream is a product from outside our selves. It’s a hand-me-down worldview. Physical bullying always starts from there, whether you’re a child on the playground or a banker on Wall Street. It originates as an inside job. I thought that was an important thing to understand, and worth building a movie on. Do you have any advice for people looking to succeed in the film industry? I’ve spent my entire adult life in the film world, where projects are scripted and predictable. But in real life the amount of chaos people are required to meet is monumental and unprecedented. Many are overwhelmed. Fortunately, there’s one skillset that can be developed to meet the challenge of change. That core competency is self-awareness. That’s what the movie is about. Milton’s Secret is in select theaters and On Demand beginning Friday, September 30. For more, check out the film’s Facebook page. To learn more about Eckhart Tolle, please visit eckharttolle.com, and more information on the fight against bullying, please visit stopbulling.gov.